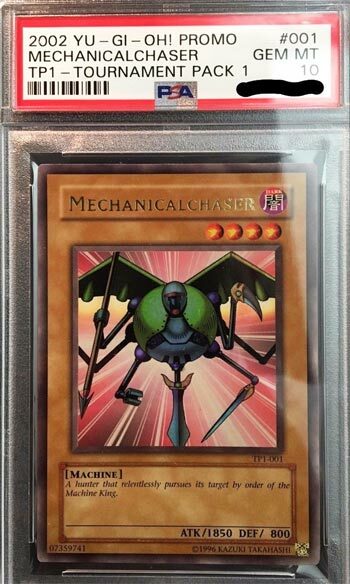 While I wasn’t surprised to see Charizard top the Pokemon Top 25 Countdown, I am surprised to see Mechanicalchaser top the Yugioh Top 25 Countdown. This card was an Ultra Rare in Tournament Pack Season 1. Tournament Packs were given out at various YGO tournaments. Rare cards from Tournament Packs can be very valuable depending on age and rarity. This was the rarest card in TP1. In October 2017, this copy sold for $1600. According to the PSA Population Report, there are only 11 of these cards in circulation right now. While this is a truly rare card, I think I’d rather invest/own the Blue Eyes White Dragons we reviewed yesterday. We hope you enjoyed the countdown! If you missed any of the cards, simply click back using the “Last Card” arrow below, and check out the rest of the Top 25.